The diagram represents the model for Elementary School Curriculum that I have led the development of during my time as Curriculum Director at Marymount International School, Paris. 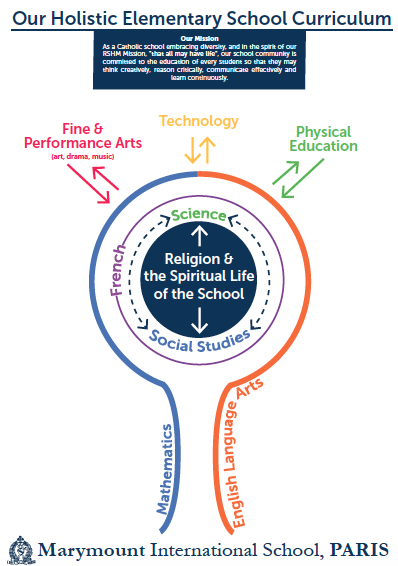 The model emphasizes that at the heart of all learning is the Religious and Spiritual Life of the School. This is essential as the school draws its mission from the Religious of the Scared Heart of Mary and subsequently the religious dimension underpins the vision of the school as a community. The arrows pointing towards Science and Social Studies stress the curriculum links between the heart of the curriculum (Religion) and these two core subjects. In practice our curriculum is designed to promote “transfer” between these subjects whilst recognizing that each subject must also maintain its own autonomy and subject specific tools for learning. Opportunities may sometimes exist for “transfer” between two of these subjects, and at times between all three. This enables the core curriculum to be delivered in a thematic manner. For example, when studying issues relating to the Environment (Stewardship) or Human Rights (Human Dignity) there will be opportunities for “transfer” between all three subjects. French is illustrated as being encircling the subject areas of Religion, Science and Social Studies. The represents the fact that in many cases the thematic units of study being studied at the Core can be reinforced through the medium of French. This is particularly pertinent in the context of Marymount, Paris, given the fact that France is the host country. Moreover French language and culture takes on an enhanced real world dimension and the “transfer” between subject areas is further emphasized. Underpinning the diagram are the two subjects that are the foundations of all learning; English Language Arts and Mathematics. These two subjects underpin learning in all other academic disciplines and in their own right are considered the most important subjects by employers. A key part of education is in preparing young people for college and the work place and young people leaving education without a good level of English and Math often find their chances of finding employment are lower, they are likely to earn less, and they have limited opportunities for progression into further education and training. The other subjects studied in the Elementary School are presented outside of the main part of the diagram with arrows pointing both towards, and away from, the Core and Foundation subjects. This is to emphasize that these subjects complement the rest of a child’s learning experience. Technology is not taught as a separate entity but in line with the real world, is integrated into children’s learning in all other subject areas. Fine and Performing Arts (Art, Drama, Music) are taught using their own skills and tools of learning whilst complementing the thematic units of study taught across the wider curriculum. Additionally children are offered the opportunity to be creative and to further develop as whole persons through the medium of the creative arts. Physical Education contributes to the holistic nature of learning – most obviously promoting physical development but still further enhancing skills of cooperation, collaboration, teamwork, grit and resilience. This entry was posted in Uncategorized and tagged 21st century learning, bigger picture, catholic, catholic schools, Collaboration, college and workplace preparedness, curriculum, curriculum design, curriculum development, education, Elementary School, holistic, human dignity, learning, Marymount International School, RSHM. Bookmark the permalink.